The master of painting and graphics, Grigory Myasoedov, presented to admirers of his talent the famous work of art “Withering” in 1876. A unique picture painted in oil on canvas. It is a reproduction of the ancient rite of the Slavs, which was carried out by peasant women at the time when cattle began to fall. By the way, such images are extremely rare. 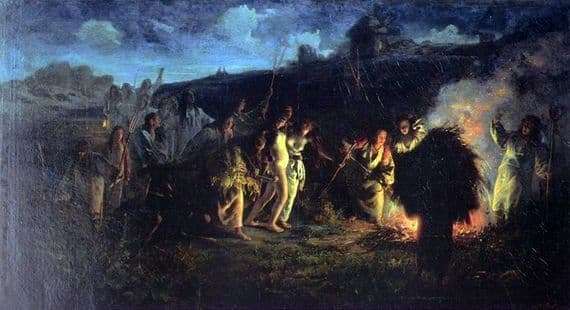 Myasoyedov decided to depict such a pagan rite, which, it was believed, is able to protect the cattle from death, because the peasants smell the whole village from evil spirits. The essence of the ceremony is that it is necessary to form a furrow around so that the “cow death” could not go through it. A heavy plow must pull an unmarried woman into it, a girl completely naked, accompanied by village women. The burning fire threw glare on the faces of the acting characters, so it’s clear that the eyes of women are full of mystical horror and panic fear. It seems to the peasant women that they are consecrated into some kind of sacrament, because the whole process has reached its highest point, after which the end should come. The main figure of the rite – a sorceress. She leads the procession, is the manager of the ritual ceremony, but this woman turned her back on the viewer. The artist did it intentionally, because the image of the witch is easy to recognize only by strange vestments. The views and thoughts of the participants in the rite are focused on fire. It is known that the fire element has a great power of purification. On the horizon seen far away begins to brighten: the morning is near. In these early twilight, the figures of many participants in the ritual are simply guessed. Grigory Grigorievich himself studied the customs of the ancestors, he infinitely believed in the miraculousness of the ritual depicted in the painting “Withering.” Artist paints created an atmosphere of hope for a good outcome under the influence of higher forces of nature.